We have recently changed venues in the City and now practise at Farringdon, a few minutes walk from our previous dojo at the Barbican. The classes will run from 6pm-8pm on Wednesdays and cost £10 a session or £35/month. Our classes in Harrow, on Thursday between 7pm-9pm will run as normal. 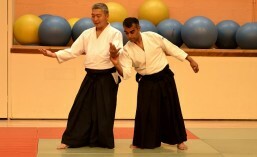 If you would like to give Aikido a try or have any other questions let us know.